ニュースタンダード MBA留学 海外大学院留学: Is the MBA Losing its Luster? 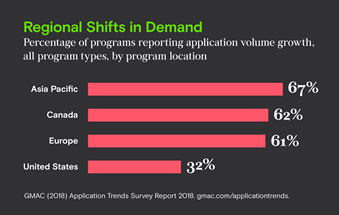 Declining application volume at U.S. business schools made the headlines when the Graduate Management Admission Council (GMAC) released the findings of its annual application trends survey earlier this week (10/1). “Applications Down at 70 Percent of U.S. MBA Programs—Including Harvard,” broadcast one news outlet. And it’s true. The GMAC data reveal that just 32 percent of U.S. programs reported growth as compared to last year. Overall, U.S. business schools experienced a nearly 7 percent decline, with domestic applications down 1.8 percent and international volume off by 10.5 percent. Europe reported 3.2 percent more apps this year than last. There were also regional variations in domestic versus international application volume shifts. 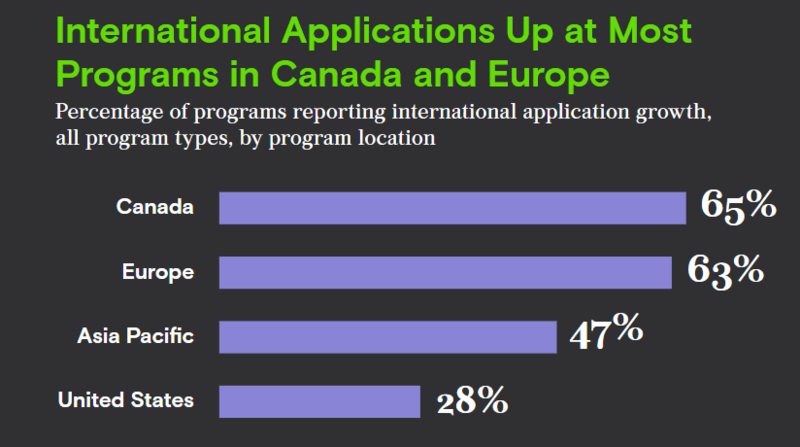 Sixty-five percent of programs in Canada and 63 percent in Europe saw international application growth. As a result, applications from international applicants outnumbered those from domestic applicants in each region. Asia-Pacific programs, meanwhile, saw increases fueled largely by domestic growth, with more candidates from those regions considering educational options closer to home. It’s the fourth consecutive year that application volume has fallen for U.S. schools overall. But this year, even the most elite MBA programs in the country are feeling the squeeze. In particular, U.S. programs have struggled to attract international applicants, with just 28 percent reporting growth this year. The GMAC survey data included responses from 1,087 graduate business programs at 363 universities worldwide, a mix of MBA, specialized business master’s, and Ph.D.D programs. The results are in keeping with application volume details we’ve been hearing and reporting on from schools since late summer. Harvard Business School was down 4.5 percent—its biggest decline in five years. Stanford Graduate School of Business saw a 4.6 percent drop year over year. The University of Pennsylvania’s Wharton School was off by 6.7 percent. The list goes on and on. Down less than one percentage point over last year, Cornell’s Johnson Graduate School of Business leads most other top schools in terms of application volume. Only Dartmouth’s Tuck School, out of all those we’ve talked with, saw applications increase. Speaking to Clear Admit over the summer, Admissions Director Luke Anthony Peña was optimistic that applications would end up being up ever so slightly. And he was right. With 0.4 percent growth year over year, Tuck’s news is the best we’ve heard. Why So Soft in the States? The Wall Street Journal was quick to say the MBA “degree had lost its luster.” For some applicants, this could be true. The GMAC survey found that a majority of European Master in Management and Master of Finance programs reported growing demand. In the United States, the one bright spot was that most Master of Data Analytics programs reported year-over-year growth, including more reporting greater increases among international applicants than domestic applicants. That said, the GMAC survey findings still show that full-time, two-year MBA programs are the most in-demand of all program types. Overall, MBA and business master’s programs reported a similar volume of applications this year as compared to last. A closer look at application drop-off at U.S. schools reveals that many factors—beyond potential diminished interest in the two-year MBA degree—have also been at play. With U.S. unemployment rates at near historic lows, many young professionals are making good money right where they are. Some are deciding the opportunity cost of taking two years off to go to school just doesn’t make sense at the moment. This can be seen reflected in the soft domestic application volume to U.S. schools: Only four out of 10 U.S. programs reported growth in domestic candidates. But this is nothing new. Business school admissions volume has taken a hit in past boom times as well for precisely the same reason—only to later rebound. Of course, there’s also the Trump factor. Whatever your politics, it’s hard to dispute that the policies or proposed policies of the current White House administration have created new concerns for international applicants to U.S. programs. Some international candidates worry that even if they get in, they won’t be able to get a visa to study at Harvard or Stanford or Wharton. According to the Pew Charitable Trusts’ Stateline report, the number of student visas issued by the United States dropped 40 percent from its peak in 2015 to 2017. For other international applicants, the possibility of not finding a U.S. employer willing to sponsor them post-graduation is an even greater obstacle. For candidates from some regions of the world, paying for a top U.S. MBA program without assurance of a U.S. job and salary upon graduating is an economic equation that just doesn’t work. GMAC’s Chowfla also underscored the fact that educational and professional opportunities outside of the United States have been expanding and improving over the past decade. The increases Asia-Pacific programs have reported in domestic growth signal that candidates from the region are increasingly viewing educational options closer to home as high value. 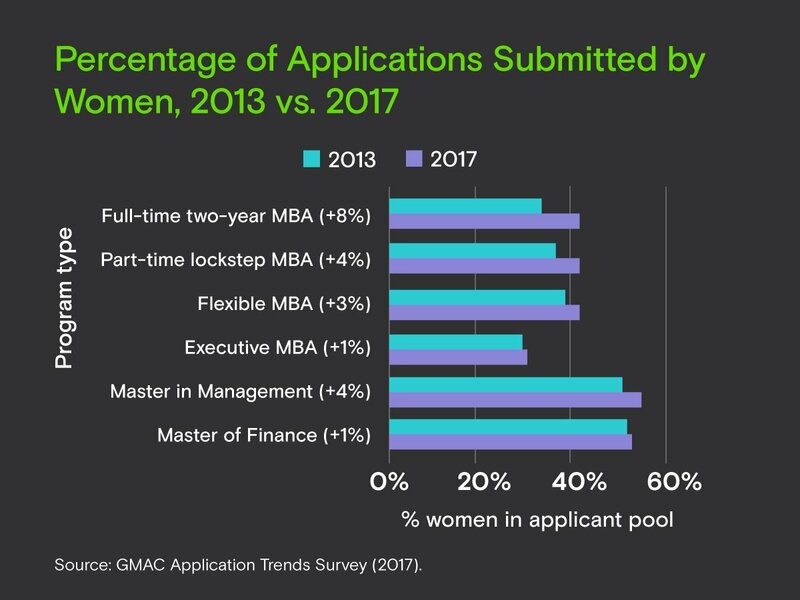 Another bright spot is that all programs have seen increasing percentages of applications submitted by women in each of the past five years, GMAC reports. Full-time, two-year MBA programs have seen the greatest increase—an 8-percentage point gain between 2013 and 2017. So far only specialized master’s programs—Master in Management and Master of Finance—have reached gender parity. And there’s this: Nine in 10 participating programs report that the applicants this year are similarly or more academically qualified than candidates last year. Finally, we should also note that the drop in application volume at U.S. schools—especially the most prestigious—in many cases represents a decline from previously record-high levels. Harvard, Stanford, and Wharton don’t run the risk of having empty seats in their MBA classrooms any time soon. But if current trends continue, it might not be the worst time to apply.